Almeda Yates was a teacher, artist, and missionary. She came to Minneapolis from Stillwater where she had been a teacher. Her past included a scandalous divorce from the Reverend Jeremiah Yates in Galena Illinois. He wrote a lengthy, angry, book about the incident. Almeda responded in a pamphlet a few years later. 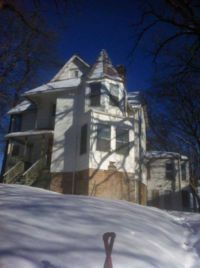 She commissioned architect William Haight and builder James Leck to build a house on the highest spot on the Hill on Hillside Avenue in North Minneapolis. The house shared the lot with an older Italianate structure which might have been a hospital or sanitorium owned by physicians Solomon Brown Sr and his son, Solomon Brown Jr.
Almeda's house was a fulfillment of her dream to be a self supporting businesswoman and artist. The house has a bold ambitious elegance with large windows that brought in plenty of sunlight and a tower which made the house much grander than any of its neighbors. Almeda had private quarters for herself an had the rest of the house designed to be a boarding house to provide needed income. Hillside avenue's adjacency to 20th Avenue North (now West Broadway) which was a major commercial district and may have been on the streetcar line attracted tenants that worked nearby or in downtown Minneapolis. Whether the older Italianate building which shared 1522 Hillside's lot was acquired by Almeda and used as a business or school, is not known. Almeda lived in the house for a few years, but then decided to go to Texas and then to Mexico to become a Missionary. The reason for her departure from Minneapolis are unknown, but it is possible the story of her divorce became known and she could have left to avoid the disapproval of her neighbors and tenants. When she left Minneapolis, mementos of her past life remained in the attic of 1522 Hillside. Clothing, letters, newspapers and a faded photo of Almeda were discovered in the attic by a group of historians in 2014. The historians were there on behalf of historic house restorer Nicole Curtis who had been brought to the house by Brian Finstad. She acquired the house a few days before it was scheduled to be demolished by the City of Minneapolis. The house was completed in December 2018.